PacBio sequencing services | BaseClear B.V.
BaseClear offers high quality services using the latest platform from Pacific Biosciences, the PacBio Sequel. We do not offer services on the PacBio RS II system anymore. 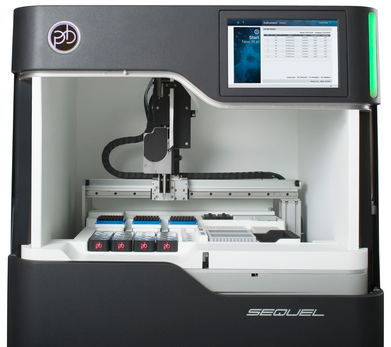 With this Pac Bio platform BaseClear offers real-time sequencing of single molecules up to 30 kb. The data has added value for de novo assembly, targeted sequencing, detection of structural variation and the direct detection of base modification. The main advantage of the Pac Bio Sequel system over the PacBio RS II platform is the higher output.